A high proportion of DAA patients had a delayed diagnosis in our Pediatric Cardiology Center. And for those patients combined with other heart anomalies, parents may be more likely to refuse surgery treatment for them. Delays in diagnosis, and parents' refusing treatment lead to poor outcome of patients with DAA. In the present report, we described the diagnosis, management and outcome of 11 patients with DAA in a children's hospital. This study was approved by Ethical Committee of Children's Hospital, Zhejiang University School of Medicine (Rf.2016-33). We retrospectively reviewed the clinical records of all the patients diagnosed with DAA in our hospital. All the clinical information, diagnosis, treatment and outcome were retrieved from the clinical records. 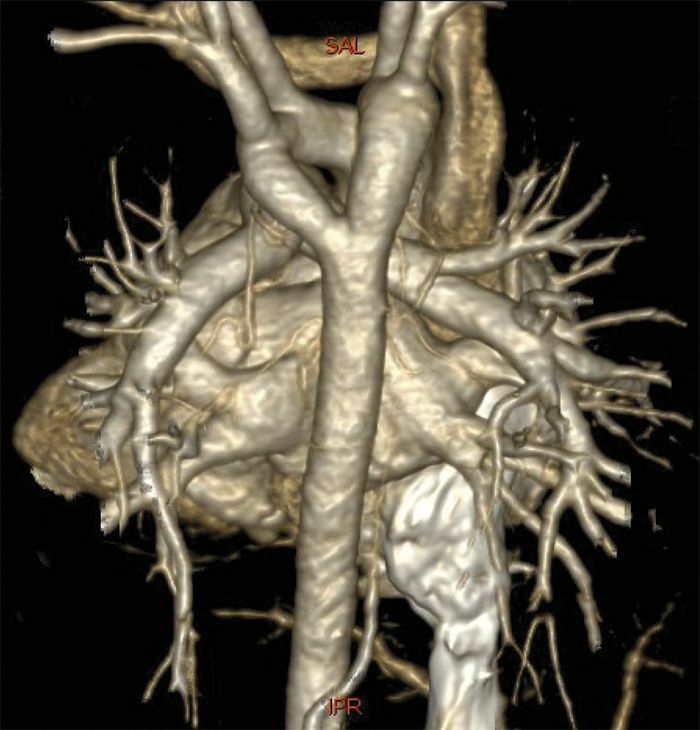 Imaging examinations included chest X-ray and echocardiophy for all patients, and a computed tomography angiogram or magnetic resonance angiogram or cardiac catheterisation when required. Bronchoscopy was used to check the tracheal compression; esophagram was done to for patients with oesophageal compression. Surgical correction was suggested for all symptomatic patients. For the patients with associated other heart anomalies, division of the vascular ring was done under cardiopulmonary bypass support; for those with isolated DAA, surgical correction was done without cardiopulmonary bypass. Non-surgical treatment included infection control, airway management and nutrition support. Eleven patients were diagnosed with DAA in the Pediatric Cardiology Center, Children's Hospital, Zhejiang University School of Medicine from 2008 to 2014. Basic demographic information and clinical characteristics of the patients are shown in the Table 1. Age of diagnosis raged from 5 days to 6.6 years with a mean of 26 months; age of disease onset ranged from 3 days to 8 months. Seven patients were males and four females. 81.8% patients (9/11) had initial respiratory symptoms including cough, tachypnoea and wheezing; five patients presented feeding difficulty or dysphagia. Seven patients had heart murmur and 3 had cyanosis. Primary diagnosis was asthma or respiratory infections in six patients, congenital heart anomalies in 4 and double aortic arch only in 1. Associated heart anomalies included atrial septal defect (ASD) in 3, patent ductus arteriosus in 4, ventricular septal defect in 2, tetralogy of fallot in 1, pulmonary atresia (PA) in 1. Chest X-ray, electrocardiogram, echocardiography were performed for all patients after admission; seven patients were subjected to computed tomography (CT) examination, one magnetic resonance angiography (MRA); Figure 1 shows a DAA encircling the trachea and tracheal compression of case 7 by CT; Figure 2 shows the double aortic arch by CT. Esophagogram revealed oesophageal compression in three patients; and three patients were diagnosed by cardiac catheterisation and selective angiocardiography. 2 12 months 7 months 25 days Male 8.5 Cough and wheezing, tracheal compression - Parents refused surgery treatment No surgery until the last follow-up. The patient has recurrent asthma-like respiratory symptoms. All patients were indicated for surgery corrections for DAA or associated heart anomalies. Five out of the 11 patients underwent surgery timely after diagnosis; five parents refused surgery treatment for their children (cased 2, 5, 9, 11) and one delayed surgery for their child (case 3). The medical records showed that the main reasons for refusal were economical problems; and all the parents who refused or delayed treatment were at a low social economical level, and 4 were migrant workers. For the other 5 patients, surgery for repairing DAA and other associated congenital heart anomalies was done after diagnosis. The median age at surgery was 25 months. For the patients who underwent at early age (Cases 1, 6, 10) and associated with minor heart anomalies, outcome was favourable; these three patients were symptom-free six months after surgery. For cases 4 and 8, respiratory symptoms including wheezing and tachypnoea persisted for one year after surgery, and improved after one year. VR are a group of anomalies caused by abnormal embryologic development of the brachial arch system characterised by an anomalous branching pattern of the vessels originating from the aortic arch, abnormal positioning of the aortic arch itself, interrupted or supernumerary arches, or anomalous origin of the pulmonary artery from the contralateral pulmonary artery or ascending aorta.3-6 Vascular rings may lead to variable degrees of respiratory problems or feeding difficulties by forming a complete or partial ring compressing the trachea, the bronchi, and the esophagus.7 DAA is the most common form of vascular rings. General pediatricians who are not familiar with this condition may misdiagnose or missed diagnose DAA. Figure 1 CT showing a DAA encircling the trachea and tracheal compression of case 7. 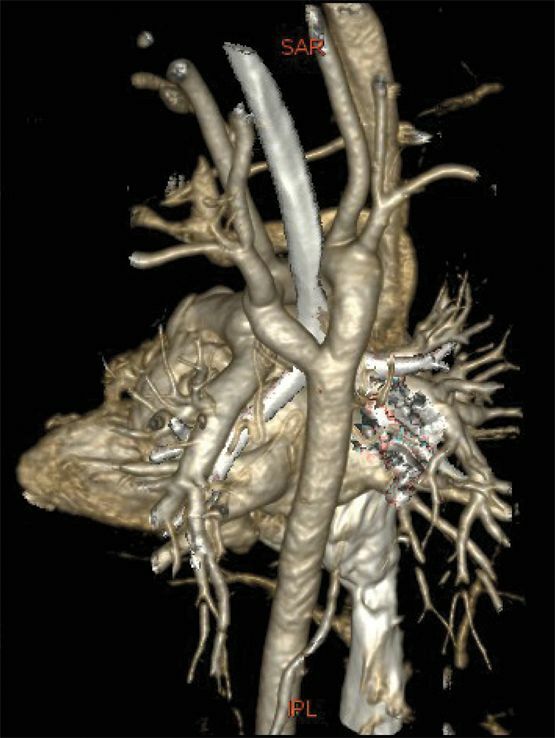 Figure 2 CT Scan illustrating the double aortic arch. The patients with a DAA may present with cough, tachypnoea, wheezing, dyspnoea, and recurrent respiratory tract infections, especially for the infants and young children less than 2 years of age; these patients are often misdiagnosed as pneumonia and asthmatic bronchitis. All the patients in this series had respiratory tract symptoms, and about half of the patients were misdiagnosed and admitted to the Pulmonology Department after initial diagnosis. Only one newborn was diagnosed timely who was suspected with DAA prenatally. The asymptomatic patients may be delayed to be diagnosed until symptoms such as dysphagia occurred in adulthood. 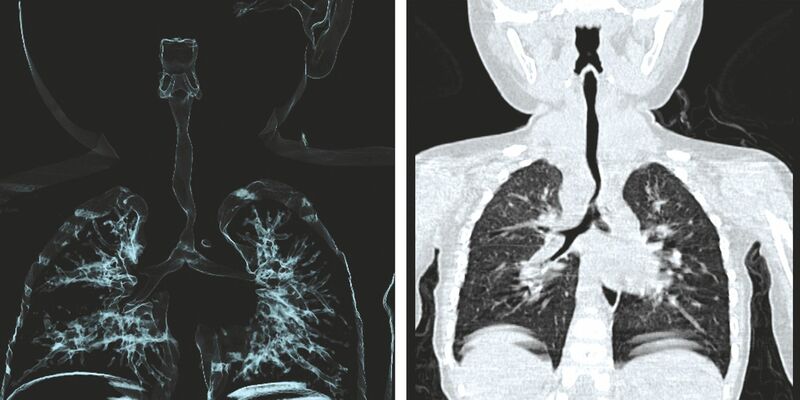 Alsenaidi et al8 made a retrospective review on 81 children with a DAA; they found that initial diagnosis can be made by chest X-ray with the major characteristics including pulmonary hyperinflation, lowering hilum of the left lung, right arch or DAA by anteroposterior position or lateral position. Chest X-ray showed no remarkable changes except pneumonia or lung markings changes. Six cases were misdiagnosed as respiratory tract infections at the first admissions to the hospital. All the patients with DAA in this cohort had symptoms, in contrast of the previous reports that most patients were asymptomatic at diagnosis.7,9 The reason maybe that our hospital is the only tertiary children's hospital in this province, and patients with severe diseases were transferred from local hospitals. Our concern is that there are many asymptomatic patients with DAA maybe not diagnosed; and symptomatic patients have been delayed in diagnosis due to lack of knowledge on DAA in many local hospitals. Pediatricians should be alert when managing those patients with recurrent pneumonia, wheezing, dysphagia, and particularly those without improvement after administering bronchodilators; vascular rings should be suspected and multi-modality imaging exams should be performed for these patients. In our series, 91% of the patients were combined with heart anomalies, and 36.1% had tracheal compression; for the patients with presentations which cannot be explained with heart anomalies, vascular rings should be considered. The diagnosis of vascular rings is relying on imaging examinations. Multi-detector row CT with three-dimensional reconstruction can clearly reveal the anatomy of blood vessels, compression and extent of narrowness, which is the first choice for diagnosis of DAA.10 Echocardiography is an indispensable assisting diagnostic modality, which can detect combined heart anomalies in DAA. For patients with tracheal compression, bronchoscopy can be performed for determining the extent of narrowness, which will be valuable for designing surgery procedures and outcome evaluation. Esophagogram is also a reliable method for initial diagnosis, however cannot be considered as the first choice because of its limitations in evaluating tracheal compression and disease classification. MRI and angiography is still not widely used in clinic because of its high cost. For the patients with symptoms, early surgery treatment should be performed. For those patients with tracheal compression, airway stenosis may occur and symptoms such as wheezing or recurrent respiratory infections may persist until one year after surgery. However, in our series, more than half of the patients refused treatment after diagnosis, including those patients with severe tracheal compression; all the patients were associated with other heart anomalies. The reasons were due to high cost and the parents were in low social economical level. The low reimbursement rate of new rural medical insurance lead to refusal for treatment in the families with very low income. The local government should be called to increase the reimburse rate of those children with complicated anomalies; and immigrant families with low income should be focused. In conclusion, for the children with recurrent respiratory symptoms, vascular rings should be considered in differential diagnosis. Symptomatic patients with DAA should be subjected to surgeries as soon as possible. Medical insurance policies should be improved for those families with low income and immigrant populations. No competing interest exists in this study. 1. Ullmann N, Menchini L, Salerno T, Tom?P, Cutrera R. Late diagnosis of double aortic arch: consequences on long-term follow-up. Pediatr Pulmonol 2014;49:E75-7. 2. Gross RE. Surgical relief for tracheal obstruction from a vascular ring. N Engl J Med?945;233:586-90. 3. Licari A, Manca E, Rispoli GA, Mannarino S, Pelizzo G, Marseglia GL. Congenital vascular rings: A clinical challenge for the pediatrician. Pediatr Pulmonol 2015;50:511-24. 4. McLaughlin RB Jr, Wetmore RF, Tavill MA, Gaynor JW, Spray TL. Vascular anomalies causing symptomatic tracheobronchial compression. Laryngoscope 1999;109:312-9. 5. Turner A, Gavel G, Coutts J. Vascular rings-presentation,investigation, and outcome. Eur J Pediatr 2005;164:266-70. 6. van Son JA, Julsrud PR, Hagler DJ, Sim EK, Puga FJ, Schaff HV, Danielson GK. Imaging strategies for vascular rings. Ann Thorac Surg 1994;57:604-10. 7. Kir M, Saylam GS, Karadas U, et al. Vascular rings: presentation, imaging strategies, treatment, and outcome. Pediatr Cardiol 2012;33:607-17. 8. Alsenaidi K, Gurofsky R, Karamlou T, Williams WG, McCrindle BW. Management and outcomes of?double aortic arch in 81 patients. Pediatrics 2006;118:e1336-41. 9. Suh YJ, Kim GB, Kwon BS, et al. Clinical course of vascular rings and risk factors associated with mortality. Korean Circ J 2012;42:252-8. 10. Koontz CS, Bhatia A, Forbess J, Wulkan ML. Video-assisted thoracoscopic division of vascular rings in pediatric patients. Am Surg 2005;71:289-91.